All transactions are safe and secure with a reliable history in online purchasing behind each of our associates. 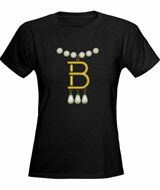 Buy the Betty B Necklace t-shirt to own Ugly Betty clothing and merchandise. Say cheese in one of these America Ferrera Ugly Betty t-shirts that display Betty's 'B' necklace. Aside from Betty's braces, the necklace is one of the most identifiable symbols for both the TV show and America Ferrera's character. It is a replica of a necklace worn by Henry VIII's second wife Anne Boleyn. The necklace is just part of the reason why Betty is elected the resident outcast in the New York City fashion industry. This design is available on other Ugly Betty merchandise items. In addition to the Betty B Necklace tee above, browse the Ugly Betty Clothing Gallery for more apparel like men's and women's clothes, kids shirts or hoodies.